This plugin automatically publishes posts from your blog to your Social Network accounts such as Facebook, Twitter, Google+(Google Plus), Blogger, Tumblr, Flickr, LiveJournal, Flipboard, DreamWidth, Delicious, Diigo, Instapaper, Stumbleupon, LinkedIn, Pinterest, Plurk, VKontakte(VK.com), YouTube, App.net, Scoop.It, WordPress, XING etc. The whole process is completely automated. Just write a new post and either entire post or it’s nicely formatted announcement with backlink will be published to all your configured social networks. You can reach the most audience and tell all your friends, readers and followers about your new post. 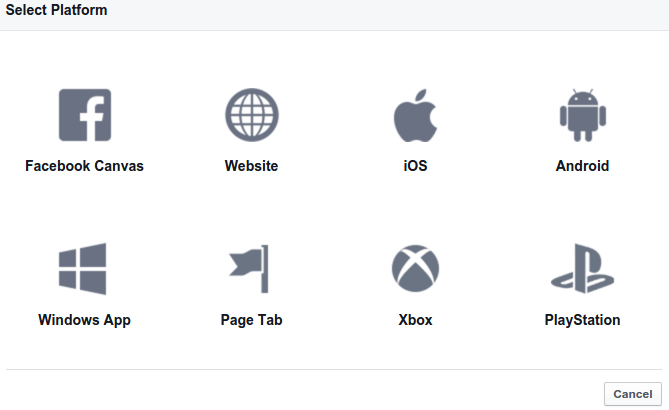 Plugin works with profiles, business pages, community pages, groups, etc. Messages are 100% customizable and adopted for each network requirements. 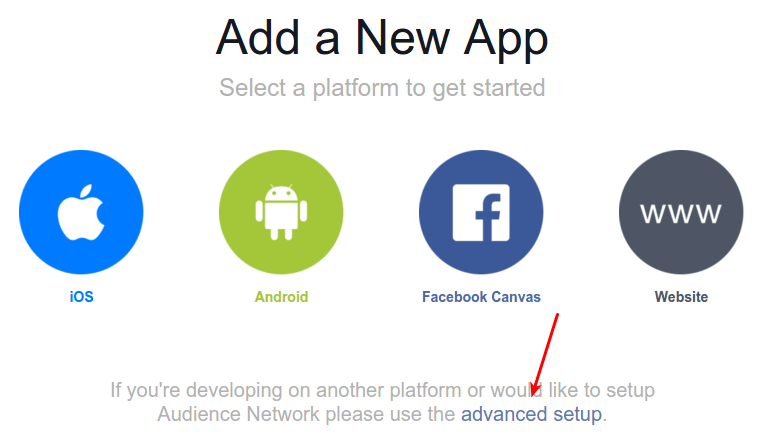 Today we’re going to look at connecting the NextScript’s Social Network Auto-Poster Plugin, SNAP for short, how to setup a connection with Facebook Page. What we’re going to do with this plugin is we’re going to take the content from our website and share them to your facebook page. That sharing is going to be done with an Facebook App. It will enable us to choose the post type, who to share with. You have a lot options with Facebook App. After you have registered, a new wizard will appear. We need to click the advanced setup link. We’re going to name our app, choose a category. You can name it to something like yourdomain.com Via NextScript. Don’t worry about the namespace. After you give it a name and choose a category, click on Create App ID. Answer the security check and you have a Facebook App created. Now the two things you need is App ID and App Secret. Click the settings tab on the left. Enter your email address on the Contact Email field. Then click Add Platform. Select website in the list. Enter your WordPress Address(URL) in the Site URL field and enter your Site Address(URL) in the App Domains field. You can find your WordPress Address(URL) and Site Address(URL) in the general settings of your WordPress Dashboard. Please note that linuxbabe.com and www.linuxbabe.com is different. In the App Domains field you do not need to include the http:// part. The last thing is click on Status & Review tab on the left. Then we need to change the No button to Yes so this App will be available to the general public. Log into your WordPress dashboard. Go to settings > Social Networks AutoPoster. Click the green add new account button. 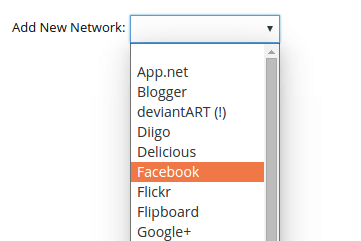 Select Facebook from the list. In the Account Nickname field you can enter something like linuxbabe.com facebook. Enter your Facebook URL. In this case I entered my Facebook page URL. 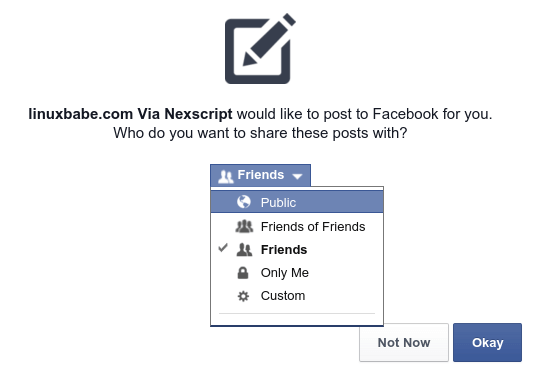 Then copy the App ID and App Secret from your Facebook App and paste them in the respective field. Now there’re a lot of options in text format and post type. Don’t worry about these right now, you can always change them later on. Just click update settings. Now you will see a warning saying Unfinished setup. So click on Show Settings. At the bottom you will see authorize your account. Click on Authorize Your Facebook Account. You will be taken to facebook website. Ignore the red alert and click Okay. Next choose who to share with. In this case I will select Public and click Okay. 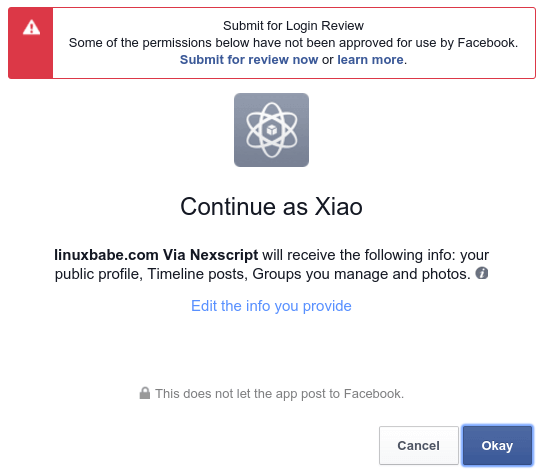 Now it ask permission to manage your facebook page. 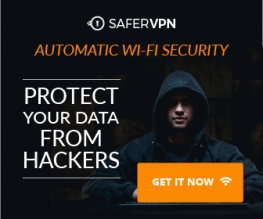 Click Okay and you will be taken back to your WordPress site. You should see the following. It means you have successfully made the connection between SNAP and your facebook account. In the above screenshot you can see a Show Settings link. Click that link. Then at the bottom, click the green Sumbit Test Post to Facebook button. It will send a test post to your Facebook page. You can now check your facebook page to see if it’s working correctly. If you see the test post then you are done and you can delete the test post from your Facebook page.